Edmond Hamilton became an obsession of mine in about 2006, when I was researching early science fiction in the lead-up to launching the Planet Stories imprint for Paizo Publishing. Hamilton wrote some of the earliest science fiction, notably in his construction of the Interstellar Patrol, which protected the spaceways of Earth’s galaxy in stories that essentially created the space opera subgenre of science fiction. Tracking down as many old Ed Hamilton novels as I could find is what started my vintage paperback collection in earnest, and I’ve been looking for this particular book for more than three years now. I finally found it at Powell’s Books in Portland (and not the big superstore, either, but the one on Hawthorne Street) this month. I find that as time goes on I buy fewer and fewer books on the internet. I’m content to wait until specific books fall into my hands on their own. The hunt, after all, is more than half of the fun. 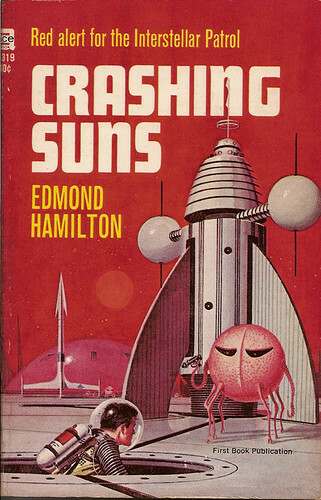 I haven’t yet read Crashing Suns (which contains stories originally published in Weird Tales from 1928 to 1930), but I did read the follow-up Interstellar Patrol novel Outside the Universe. Unlike many of Hamilton’s early fiction (such as “The Metal Giants” or “Locked Worlds”), I found Outside the Universe a mostly charmless historical artifact with little modern appeal. I’m not as eager to read this book as I once was, but I’m thrilled to finally have it in my collection. The cover art is uncredited, but I strongly suspect it was painted by Ed Emshwiller. I love the bold red background and the little round pink alien with the nasty eyes and the dainty pistol. Not much modern appeal (and lots of Hamilton at webscriptions).